UltraFlex™ heavy duty hose is made with the thickest seamless PTFE liner in the industry and offers the largest size range (1/2" - 6") which makes it ideal for nearly all demanding high purity and chemical applications. The open pitch spiral convolutions facilitate cleaning because they're self-draining, and the tight bend radius of UltraFlex hose is perfect for space-constrained locations. 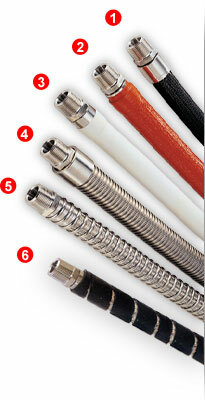 To ensure continuous fluid contact with PTFE throughout the hose assembly, the PTFE liner can be cuffed and flared through for a continuous fluid conduit. Sanitary – FDA-approved materials meet or exceed Pharmacopoeia Class VI and 3A standards. Compatible - Will not contaminate or impart taste, color, or odor to any media. Durable - Engineered for extended use in hostile environments involving severe chemical, thermal, and mechanical stresses. Does not suffer from aging or ernbrittlement like rubber, even with extreme thermal cycling. UltraFlex™ thick PTFE liner can be passed through the end fitting and flared radially outward against the sealing face to provide a continuous PTFE fluid conduit. UltraFlex™ heavy wall PTFE makes it ideal for vent tubing or flanged hose assemblies where line pressures are relatively low. UltraFlex Spiral Vent Tubing assemblies provide excellent flexibility, are light weight and have superior chemical resistance. 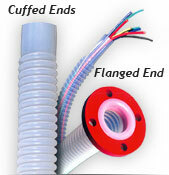 Available in sizes 1/2" to 6" with cuffed, flanged or a variety of other end connections and materials.